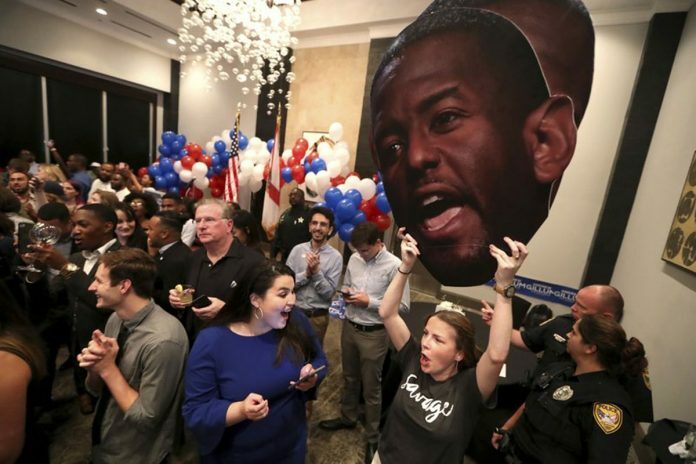 Gillum’s victory could further energize black voters in a year when Democrats are already counting on high turnout among minorities to buoy the party in the November election. Democrats also eyed congressional pickup opportunities in Florida as they try to flip control of the U.S. House. DeSantis was one of several Republicans running in contests Tuesday in Florida and Arizona — both important political battlegrounds — who hoped that cozying up to the president would be rewarded by voters. Trump has thrust himself into the forefront of the midterm campaign in hopes of motivating his supporters and offsetting Democratic enthusiasm. Donna Shalala, who served as President Bill Clinton’s Health and Human Services secretary, claimed the Democratic nomination in Ros-Lehtinen’s district. The primaries in both Florida and Arizona were closely watched for signs of how the political battlegrounds might tilt in the 2020 presidential election.